This morning I decided to empty my camera card. It was getting a little out of control. There were photos from over a year ago; photos of spring ephemerals, the prairie burn at Taltree, of fall color and lots for recipes that I never got around to posting. I found a whole series on making rosemary onion bread. How had I forgotten about this? How have I never posted about this bread before? Oh, I did way back when I started this blog. Now that I have more experience baking, writing recipes and taking my own food photos; it's time for a sequel. Rosemary onion bread is a soft bread with a slight sweetness from the green onion and an earthy pungent flavor from fresh rosemary. I'm pretty sure I could eat a whole loaf by myself with just a little bit of butter. Although between you and me it doesn't even need the butter. This loaf is a little too tender to hold up as sandwich bread, instead serve it with a bowl of soup or as a side at Easter dinner. Pour the cup of warm water into a large bowl. The water should be about 115 degrees F, about the temperature of a nice bath. Add the brown sugar or honey and stir to dissolve. Then sprinkle the yeast on top. Cover the bowl with a towel and allow the yeast to bloom for about five minutes. Meanwhile, mince the green onions and rosemary. 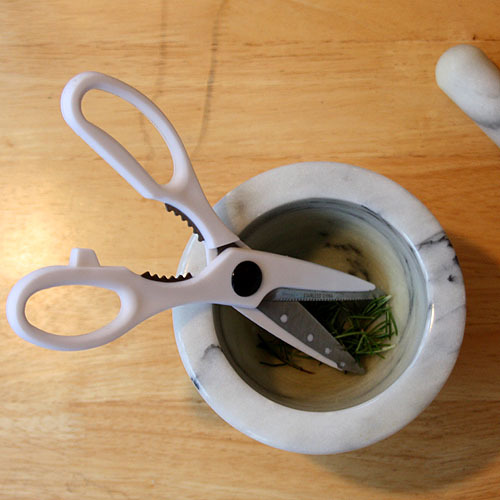 I put the salt, rosemary and onion in a mortar and use the kitchen shears to chop right into the bowl. It's a handy way to save on dishes because the next step is to bruise the rosemary and scallions. Give them a good grind in the mortar with the pestle. Crushing the leaves allows all the savory oils to come out. This is the same technique used to make authentic pesto. I found my mortar for ten dollars at an Asian food market. They don’t have to be super expensive. If you don’t have one, you can put the herbs into a baggie and mash them with a rolling pin or flat bottomed drinking glass for the same effect. This is the secret to really flavorful herb bread! To further increase the potency mix the herbs and butter together. This will infuse the savory flavors into the butter. 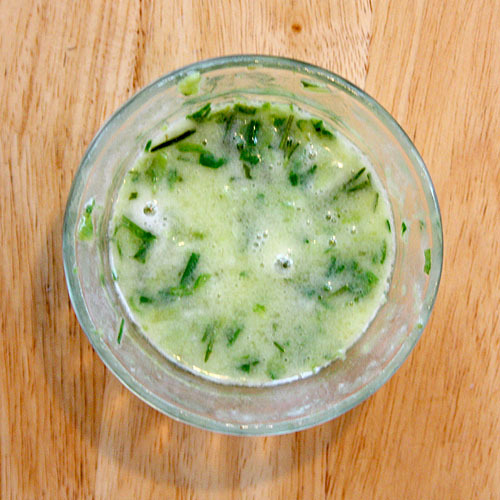 Scrape the herbs out of the mortar and into a microwave safe dish. Add the butter and microwave for 15-30 seconds or until the butter just liquefies. Stir until everything together. Check on your yeast to make sure it has bloomed. The water should now be covered in a thin layer of frothy foam. Using a wooden spoon, stir in the salt and one cup of flour. Once the herb infused butter is cool enough to touch add it to the yeast mixture. Continue stirring in the flour a half cup at a time until the dough is really hard to mix. Then use your clean hands to knead the dough. I like to knead right in the bowl or you can turn it out on to the counter. Knead for about five minutes until the dough is elastic and still a little sticky. Pour a little oil into a large clean bowl, place the ball of dough into the bowl and turn it to grease all sides. Then cover with a towel and allow to rise in a warm place until double. Depending on how warm your place is this could take thirty minutes to an hour. Preheat the oven to 375 degrees F. Generously grease the bread pan. I use a standard loaf pan, but you could use a 9" round or even a cookie sheet if you want a more free-form loaf. Punch the dough down and turn it out on to a clean work surface. Roll out the dough into a 10 inch by 20 inch rectangle. It doesn't have to be exact. Roll the dough up lengthwise so you have a 10 inch log of dough. Then tuck the open ends under and lay the dough seam-side down in your greased pan. Allow the dough to raise for second time until double. This rise will go quicker; fifteen minutes to a half hour is all it should take. Bake your loaf for 30-45 minutes or until the top starts to brown. When you turn your loaf out the sides and bottom should be a rich golden color, if they aren't put your loaf back in the oven for another five minutes or so. It's very disappointing to cut into a loaf only to find the middle is still doughy. Once you've achieved the lovely golden brown, turn the finished loaf out on to a cooling rack. This keeps moisture from condensing in the pan and making the crust soggy. 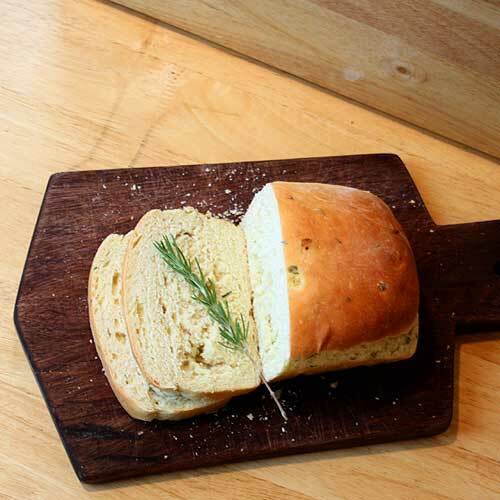 Allow the rosemary onion bread to cool at least five minutes before you slice into it. Try not to eat the whole loaf in one sitting! This post was submitted to yeastspotting. I've been reading your blog since you were on your minimalism kick, and I've been really enjoying your recipes now that you're focusing more on the food again. I just wanted to ask, at what point do you add the salt? 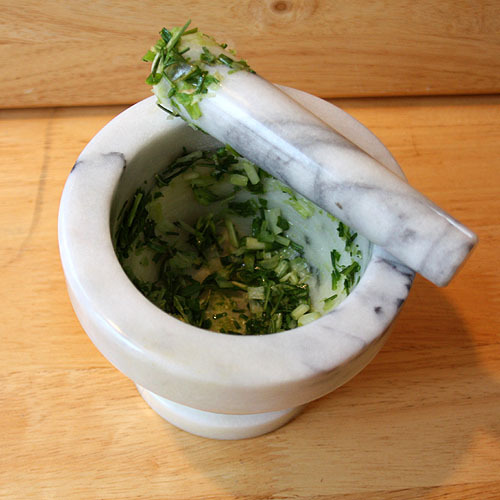 If it were me I might put it in the mortar with the herbs, since it would grind up the herbs more effectively. What did you do? This looks absolutely delicious and I totally want to try it. I know what you mean about upgrading your dish after a few years of cooking/baking experience. I did that with my recent post on the blueberry-lemon crisp which was one of the first dessert I made 2 years ago. It makes a major difference. I will sure try your updated version of your bread. Thank you for updating this lovely recipe. Your bread looks so perfect and fluffy - it would be home in any rustic bakery here. I can't wait to try - and I also can't wait to see what other bread recipes you share! I love herb breads! I can't wait to try this one, thanks for the recipe! This looks heavenly!! Can I have a slice? I can only imagine how good this would be warmed with a tad of butter. rosemary is by far my fav savory. Love the updated loaf! Wow, your photos are beautiful - I can almost reach out (I wish) and grab a slice or two of that delicious bread. This looks delicious! I make a rosemary and onion focaccia and just love the flavor combo. Thanks for sharing! i havent yet made homemade bread - but this looks lovely! This is a wonderful bread recipe. So you just gave me an idea for what to make for Easter dinner! I am sure this bread will be rich with flavor! Thank you for sharing it! Fresh bread is irresistible and this is going to be wonderful! This would make terrific toast! I am slowly building my bread baking skills ... and this one looks like a wonderful 'add' to the recipe file ... love the tip on accenting the herb flavors! Who knew?!? Yum! the bread sounds terrific and I can't wait to toast some rounds to float on soup, or to crisp up for croutons - that is IF there's any left after we enjoy it warm. I have an overactive rosemary plant and always welcome new ideas to incorporate it's pungent flavor. This looks SO good... I love bread. haha! I can see my family really enjoying this bread, and I can't imagine how amazing it smells baking! Definitely a tasty bread to have around. The smell during baking must be wonderful. Your mortar & pestle looks familiar. Same one sitting on my counter. This bread looks delicious! I love breaking bread. Your recipes are fabulous and this one I couldn't wait to try. I have a huge Rosemary bush in my yard, the smell of Rosemary is behind words, I love the smell. I did make this and it was gone very quickly with a Beef Stew I made. Love your recipes, excellent.